It was indeed another glorious day for the Olatunde and Awogboro families when they hosted the traditional wedding/engagement ceremony of their children: Temilade and Tayo. The ceremony held at Landmark Event Centre, Victoria Island, Lagos was filled with glamour, colour and culture. There was no dull moment as the Yoruba wedding traditional rites was in full swing throughout. The bride, who looked radiant in her sparkling attire with enough smiles to match, complimented her heartthrob, who was very dashing and exuded so much joy like true Prince Charming. From the body language shown by this pair, it was obvious that they were truly in love. As it is the norm, the groom’s family began proceedings when they came to pay homage and exchange pleasantries with the family of the bride. It was after they had been comfortably seated that the groom and his friends were invited.He too arrived in style with a large entourage. As soon as he got to his in-laws, he like a well-groomed Yoruba man, prostrated as a sign of respect. He was not alone. His friends too joined the great expression of respect which is held very sacred in Yoruba culture. He was then showered with prayers, first by the Olatunde family and later by his parents and elders of his family. With the wide smile on his face, no doubt, Tayo was enjoying every moment of the ceremony. 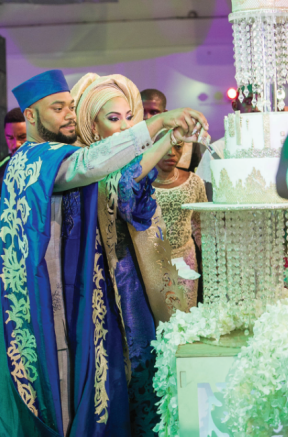 Accompanied by drummers, dancers, friends and family members, the resplendent bride breezed into the venue. Taking one step at a time gingerly, like a Princess, she danced majestically to the centre of the arena. Each step o the way, she was showered with prayers and applause. Prayer is key at occasions like this, and the bride also got this spiritual fortification aplenty from her parents and members of the Awogboro family. It was only after this session of prayers that she was allowed to identify and join her husband! This was a union of two top families and the evidence was in the number of VIPs at the ceremony. However, it must be said that the groom’s mother, Mrs. Adetokunbo Awogboro, Founder of the famous, Nail Studio, who has been in the grooming business for almost two decades, took this ceremony more seriously that others. Deep into the ceremony, she was still seen giving instructions to ensure that guests were adequately pampered. It must be said that in terms of planning and execution, this was one classy occasion that will linger in the hearts of many for years.